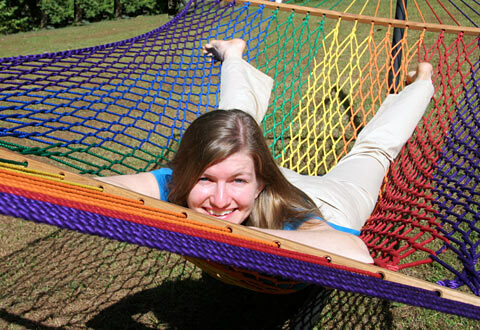 Our most popular hammock through the years. Woven by hand using our traditional knotless weaving techniques. 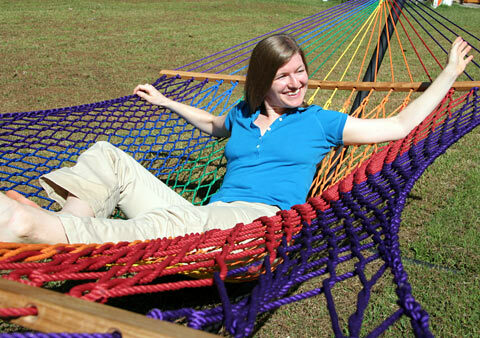 Made with hundreds of feet of soft, long-lasting, color-fast olefin rope. Highly resistant to mold and mildew. Can be left outdoors in every kind of weather. Harnesses are macrame olefin with weather-coated steel rings and attached 16" chain. Natural oil finish on solid white oak spreader bars. Bed size 7 ft. x 5 ft.